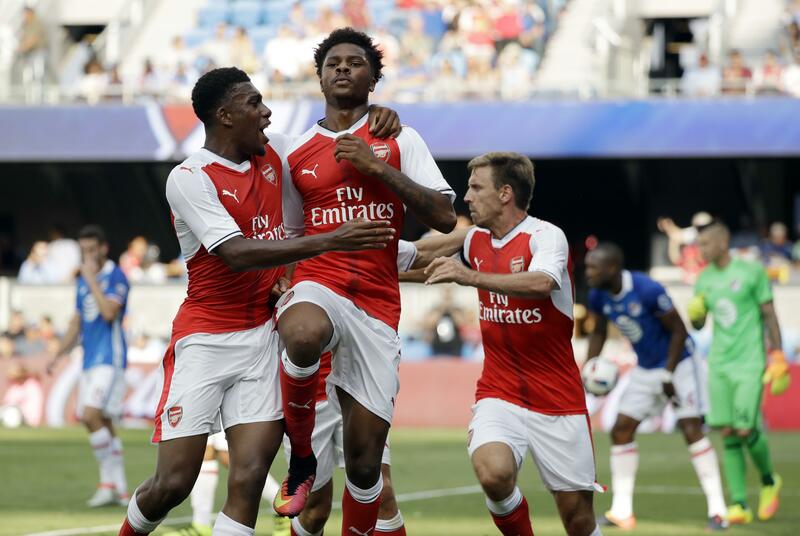 Thu., July 28, 2016, 8:21 p.m.
SAN JOSE, Calif. – Chuba Akpom scored the deciding goal in the 87th minute from about 4 yards out on a cross from the left side by Nacho Monreal, and Arsenal topped the MLS All-Stars 2-1 in the Major League Soccer All-Star Game on Thursday. Once Arsenal’s young substitutes got going after entering midway through the second half, the scoring chances came. Moments before halftime, Montreal’s Didier Drogba scored on his third try following two deflections in one quick sequence for MLS to notch it at 1. Drogba’s first attempt ricocheted off goalkeeper Petr Cech and the next off Alex Oxlade-Chamberlain before he converted with a shot to the right upper corner of the net in the second minute of stoppage time in the first half. Giovani dos Santos jumped on Drogba’s back to celebrate. Joel Campbell scored on a penalty kick in the 11th minute for Arsenal following Jelle Van Damme’s yellow card for grabbing. Campbell converted the penalty kick with his left-footed shot to the left of a diving Andre Blake of the Philadelphia Union. There was a scare for the MLS team in the 22nd minute, when Dallas star Kellyn Acosta collided with Francis Coquelin. A trainer came out as Acosta grabbed at his right ankle but he got to his feet and stayed in the game. Wondolowski had a shot soar over the crossbar from just inside the 18-yard box in the 82nd minute. Landon Donovan, a 14-time MLS All-Star and former San Jose great, was on hand and posed for photos with MLS commissioner Don Garber. State-of-the-art Avaya Stadium, in its second season, is an 18,000-seat soccer-specific stadium boasting the largest outdoor bar in North America behind one goal – a huge hit before the game with fans clad in Arsenal gear. Arsenal, managed by Arsene Wenger and preparing for the English Premier League season following a second-place finish in 2015-16, had huge sections of fans among the sellout crowd of 18,000 on a hot Bay Area day. Five MLS players were back from the 2015 All-Star team. This year’s group was coached by Earthquakes coach Dominic Kinnear. MLS teams are 9-4-1 and have outscored opponents 25-23 in the league’s summer showcase event, including a 2-1 win against Tottenham Hotspur last year in Colorado. The privately funded, $100 million stadium broke ground in October 2012 and is known for its technological capabilities and other unique elements such as food truck options for concessions with an expansive grassy area for kids to play or watch a game on the huge video board. The seats are also three shades of blue with a few red ones mixed in to honor the colors of past Bay Area soccer teams. The steep seating provides an increased noise level and keeps fans closer to the action. There is also an all-standing section behind one goal. Published: July 28, 2016, 8:21 p.m.